We offer a wide range of septic pump truck sales and repair services for our industrial and commercial clients in and around Orlando, FL. Septic pump trucks are very useful for companies that offer septic system service. 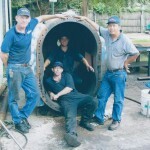 One of the most important aspects of septic system maintenance is routine cleaning and pumping of the tank. This process can help reduce sludge buildup, which means that liquid and waste can flow through the pipes more easily. If the sludge does build up, it may clog and result in an overflow of the tank. If you are looking to add a commercial septic truck to your fleet, call us at Pat’s Pump & Blower. We offer a wide range of septic pump truck sales and repair services for our industrial and commercial clients in and around Orlando, Florida. With more than 25 years of experience in the septic pump truck sales & repair industry, we are a worldwide provider of these trucks and other types of equipment. Not only can our team help you find the perfect septic truck for your business, but we can also provide service and repairs for most of the top brands. We will come to your location and provide a free on-site inspection of your septic pump truck. Our team also provides 24-hour emergency service for anything that simply can’t wait. One tip that we recommend is keeping your valves open at night and ensuring that the pump truck is clean and well maintained. This can help reduce the risk of mold and mildew growth. Give us a call today to learn more about the septic pump truck sales & repair services we can offer to your business.